Monday we arrive at Fort Clark Springs RV Park - the historic fort being the only thing here except for a gas station/convenience store and two little eateries. The fort is also home to the majority of residents in what are now private properties. It's definitely "different". Narrow asphalt interior roads lead to asphalt tight sites. Level with 50 amp FHUs and a nice green area out our front window. Maybe ten of the 85 sites are for over-nights, the rest are all working permanent residents. No idea where they work, there's nothing here. Thought we'd visit Kickipoo Caverns State Park, but it's closed this week for hunting. Again, "different". I'm disgusted to see there is a trophy hunting ranch outside of town. All of the land is owned by a handful of ranches leaving zero access to anywhere off the state highways. We do take a couple drives, and chill out at home before moving on. A lone hawk surveys the area. This Oryx herd is fortunately not on the trophy ranch, so they may be strays or rescues. Their horns can't be easy to navigate in the thick Mesquite. Several Armadillos along the roadside - they're so weird looking! A handsome bull - one of very few cows on all of this ranch land. A herd of pretty Chital (axis deer) visit us at the RV park. We fail to successfully get ahead of the wind on Wednesday morning, and I fight it all the way to Marathon, Texas. For the first time in months we see real mountains - and we're happy to be back in the West! Crossings at Seminole Canyon and the Pecos River are especially beautiful. 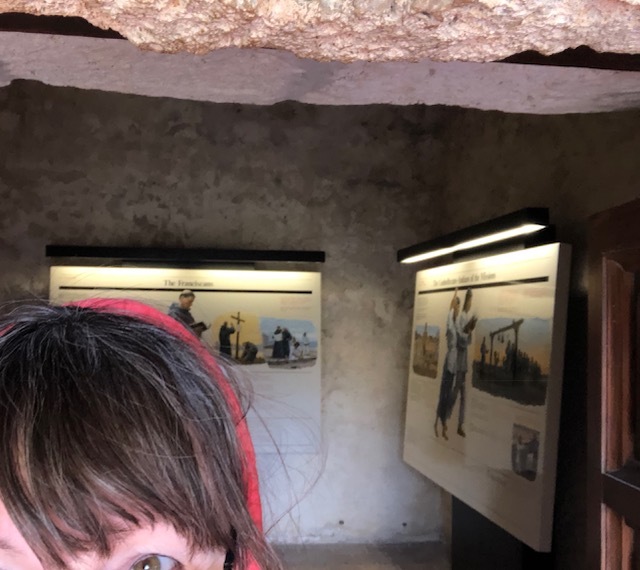 After reading Laurel's post (Raven and Chickadee) about the quirky little towns of Marathon and Terlingua they visited last year at this time, I was happy to route us here. We love quirky! Normally they do star-gazing from the beautiful courtyard, but with the bright full moon, and the very cold night time temps, nobody comes out. With more fenced-off private land, we probably could have done just a couple days in Marathon, but we're here for six, and of course we make the best of it! Post Park, a small desert oasis 5 miles south. As soon as we park the welcoming committee waddles right to the Jeep. They make a u-turn when Tessa pokes her head out the window. She never bothers them as we explore. It's a long drive, but we make our way to the Elephant Mountain Wildlife Management Area so we can "get behind the fence". All to ourselves, we enjoy the quiet and getting some dirt on the tires. Happy to have mountains in our views again! Yuccas blooming among the gold grass. A bright spot of winter orange. Texas still-life in the abandoned orchard. Pretty long views on our way home. Later the western skies steal the show. 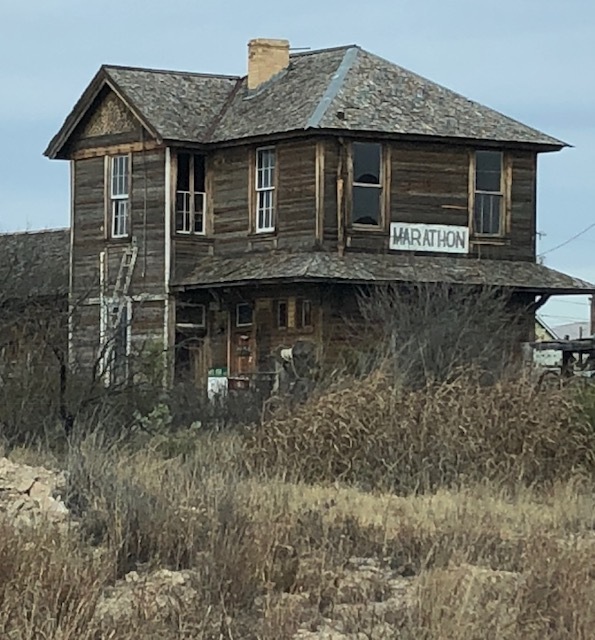 Although the train moves rapidly through Marathon now, and there are only a couple small cattle herds visible, Marathon was established in 1882 as a major shipping and supply depot for local ranchers. During the Mexican Revolution, Captain Douglas MacArthur moved troops into the area to aid civil authorities in maintaining order. He was later replaced by Lt. George S. Patton. A little place prepared some very big names for bigger battles! Many industries, including a short oil boom, came and went and the population fluctuated between 218 and 1,000 over the decades. Today 462 residents live in what has become little more than the "gateway to Big Bend National Park". The Eagle was the only local newspaper in Marathon - from 1908-1912. Lovely Christmas window at one of three main street shops. Built in 1927 by local rancher Alfred Gage, it is now owned by Stephen Austin descendant JP Bryan who has restored it to a beautiful western destination. Zane Grey is said to have written one of his famous novels while staying here. The hotel grounds offer a beautiful setting in the center of town. How we like our holiday crowds! Gage Gardens offer a pretty place for walking - even in the sparse winter season. It's not the beach, but big lawn zoomies are fun too! A fun character with wild hair! This straw-bale B&B is a bright beauty in an otherwise brown setting. A drive north on Hwy 385, we find a dirt road that takes us into a pretty canyon and around a few smaller ranches. We spend the afternoon exploring - finding a surprising number of critters along the way. Touches of color along the canyon. Easy to see why they're called Mule Deer. Ears nearly as big as the rack! Even a cattle tank can be pretty in the desert. A rare "push me-pull you" - so clean and shiny! Prairie Dogs pop up for a quick peek. A large shadow ship passes beyond the dark waves. We love spending part of Christmas morning on Skype with Ezra and his family. 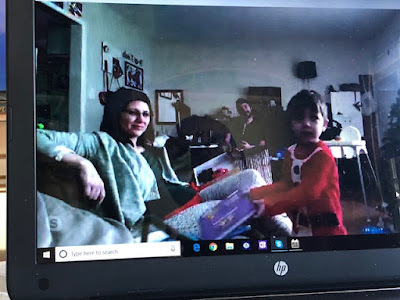 Hard not to be there in person, but it's fun to share his excitement. Showing us some of his goodies. 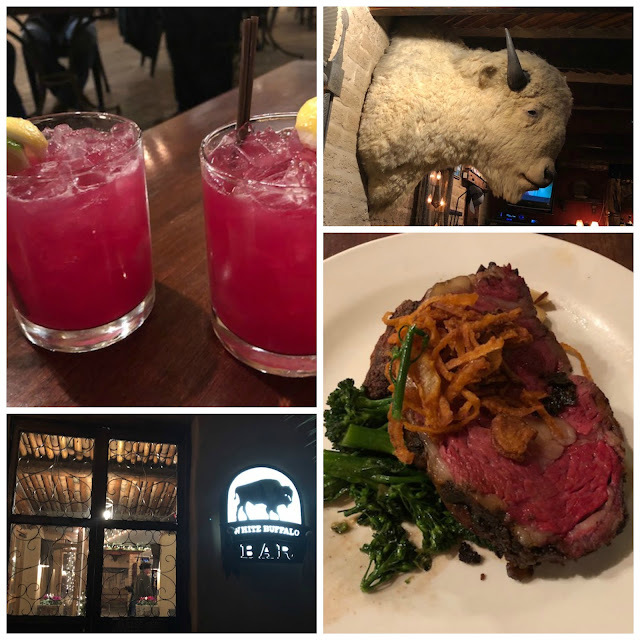 We enjoy a lovely Christmas evening at the Gage Hotel with delicious Prickly Pear margaritas (as recommended by Laurel) and a couple exceptional dinners. 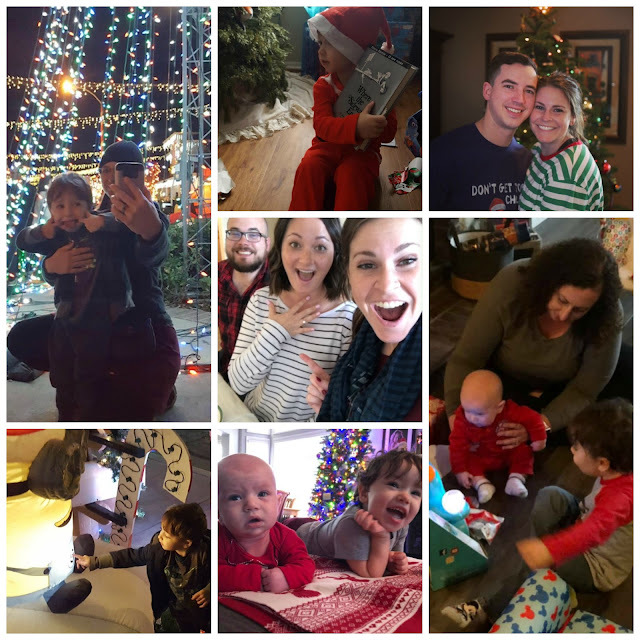 Lots of family Christmas fun - including an engagement - Congrats Corey and Christie! Next stop the breath-taking Big Bend National Park! 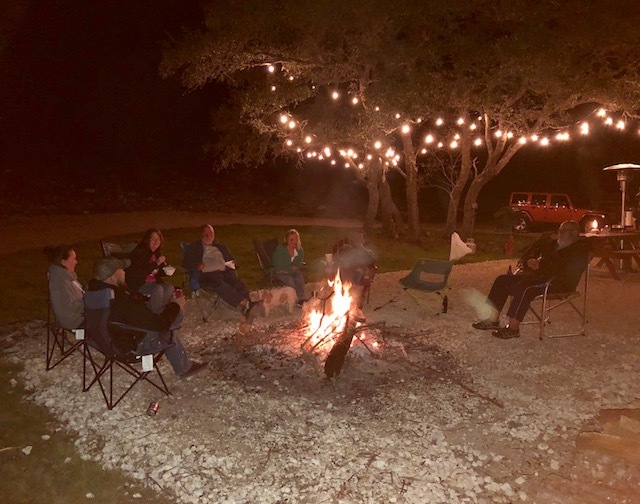 Several weeks ago our good friend Kelly (bkamericanodyssy.com) reaches out to let me know they're in the hill country north of San Antonia this week. Of course we don't hesitate to make arrangements to meet. They're staying on friends' property while Bill works in the area making more RV'ers' solar dreams come true. Wednesday we explore a long loop to end up at their place for dinner (score!). It's a cloudy day, but it's warmer and the winds hold off until the next day. Interesting rock shelves along the river. 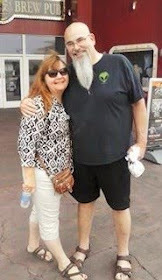 The first year we were on the road we met several RV Dreamers in Quartzsite - Cori and Greg were one of those couples. And their place is where we're having dinner! Definitely nice to have this time to get to know them better - their property is a little piece of heaven. We also meet new friends Jason and Brandy who are in between jobs at disaster areas. 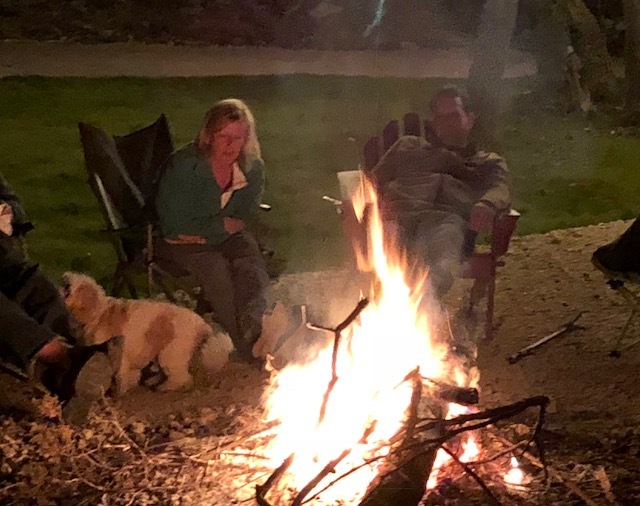 Jason, Brandy, Kelly, Bill (and Hobie), Cori, Greg and Bill enjoying a perfect fire with great weather and cold brews. Life is good. Hobie only has eyes for Bill (Kelly's Bill). Love these wonderful friends - thanks Bill and Kelly for a fun evening. As anticipated, the high winds arrive on Thursday. A perfect day for going to the movies. We both enjoy Fantastic Beasts - Crimes of Grindelwalde although for a new theater with a full bar, the seats are very uncomfortable. It's light when we get home, and we don't notice that the power is out. So we're using power like we have it :-) When the lights and TV go out we finally notice the whole park is dark - and our dead batteries tell us the rest of the story. One thing I always do is make sure we have over 1/4 tank of fuel, just in case we lose power (it's never happened) and have to run the generator. Except.....yep, except this drive when I didn't want to hassle with a fuel stop. Of course. Not Bill's thing, I want to visit the missions. It's still windy and cold under mostly blue skies, so not many others have the same idea. Nice. Mission San Jose is the largest, and most fully restored of the four missions. Shapes and layers add to the character. Restored in the 1930's by Works Project Administration. Part of the two story living quarters. Vestibule off the front doors. Mass is held every week at each of the missions. One of the best videos I've seen is shown in a large theater at the visitor center. It is a unique perspective told by both a historian and descendants of the Indians who lived here. Many of the hunter/gatherer tribes came here seeking protection from hostile raiding tribes and exposure to small pox by increasing European settlers. They gave up their freedom, their culture, their language, and their names. Still, there is a sense of pride in these beautiful missions by the families of those who built them. The reality of slave-like conditions, the many deaths by the small pox that found them here, and the sometimes cruel treatment is not covered up, but it is only part of the story. I strongly recommend seeing the film as your first stop. Mission Conception is the oldest un-restored stone church in America. It is also surrounded by commercial and residential growth. One step inside and you can feel the history. Original fresco paintings throughout the church. Mission San Juan has no interior access, but the grounds are beautiful. Mission grounds were fortified, with some areas looking more military than sanctuary. Mission Espada, established in 1690, was the first mission in Texas, and is also my favorite. I love the keyhole door. Franciscans still live on site in rooms along this pretty walkway. The peaceful grounds hold stories in the old trees and bricks. No colors on the walls or windows, the church still feels warm. I light a candle for tolerance. A small interpretive center holds artifacts and photos from a different time. Just outside the grounds is the 18th century Espada Aqueduct, still moving water from the San Antonio River to the gardens at the mission. The River Walk is never far from anywhere I go - these raw sculptures catch my eye on the way home. Other than a quick trip to the vet for Tessa's vaccination, and a mediocre brunch, we spend a lazy weekend at home. 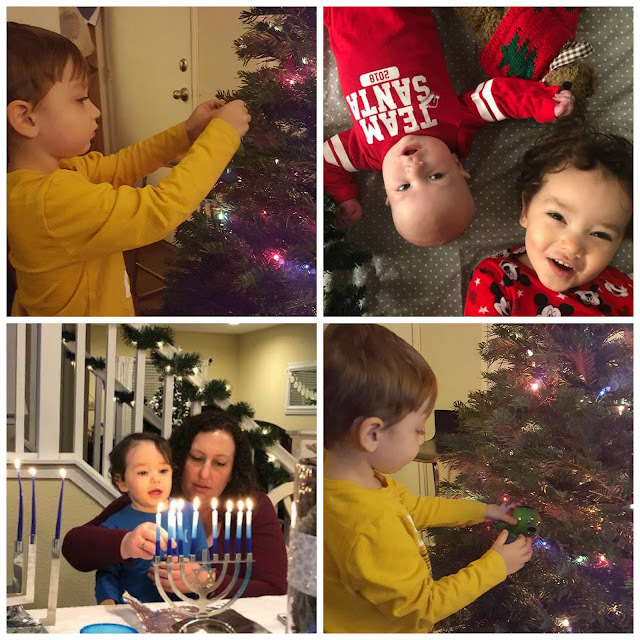 In California the grandsons are embracing the holidays. We miss them so much - even more this time of year. Holiday Blessings to you and yours - may all our words and actions begin with kindness. We're There for the Mars Landing!